Natalie Braman D’Mello had a tear in her eye as she showed the scars from her third attempt at taking her own life when she was just 15 years old. Since then, she has lost count of how many attempts she has made. She says that she never really wanted to die. She just wanted to find a way to stop the relentless feelings of despair. Natalie thought that she had her life figured out from a young age. When she was only 4 years old, Natalie decided that she wanted to be a fashion designer. She based her identity around this plan. By 15, she was accepted into a program taking classes at the Fashion Institute of Technology in New York, but things did not go as planned. A student who was a year younger than her made a better sketch and Natalie was told that she would have to practice sketching 8 hours a day to improve enough to make it in the fashion industry. This began Natalie’s first spiral into depression. The identity that she had created for herself for the last decade seemed to be out of reach. She didn’t know who she was anymore and shut down. Natalie started avoiding people, even going as far as to take a longer route between classes so she wouldn’t have to talk to anyone. She lost a lot of weight and started to hide in her room, sleeping up to 22 hours a day. Then the gossip started at school and Natalie attempted suicide for the first time. She was admitted to OSU Harding Hospital, but by her junior year of high school, she had spiraled and attempted two more times. She missed so much school that she felt like she would never catch up, but her strong support system of family and friends helped pick her back up and she got through high school by taking supplementary online classes. 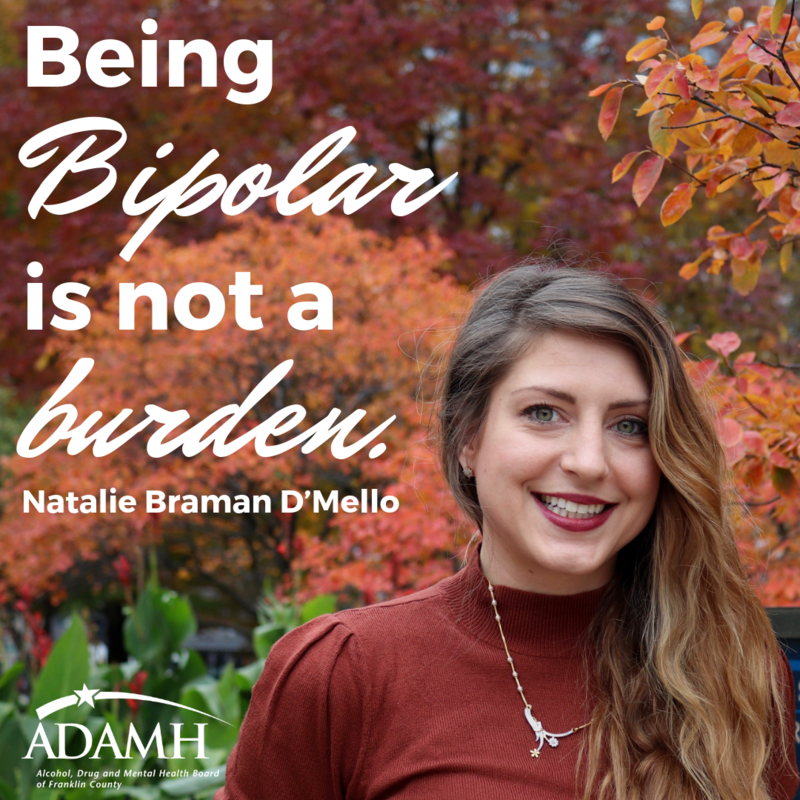 At the time of her first suicide attempt, Natalie was diagnosed with major depression, but the medication she was given pushed her to a manic episode which led to her official diagnosis of bipolar disorder. Although Natalie was relieved to have an official diagnosis and some answers, she pushed aside her mental health for years, missing appointments with her doctors and counselors at North Community Counseling Centers and being inconsistent with medication. In 2010, Natalie’s father lost his job, pushing the family into a financial crisis which she feels led to her parents’ divorce. Following stays at Netcare and Twin Valley and some time at a half-way house, she discovered that the home she grew up in and was hoping to return to was under foreclosure. Fully manic and delusional, Natalie ended up escaping from another hospital stay, walking alone outside with no shoes in the middle of a cold November night. The mania continued and, Natalie now realizes, she was not living in reality. She tried to start her own business, incurring $4,000 in debt using her mother’s credit card to buy phones and tablets for her employees. During this same time, she attempted to climb out a window while taking a bath in an acquaintance’s home. The police were called and she was taken back to OSU where her journey had begun years earlier. After first fighting against the doctors, Natalie finally began to accept that she needed help. “I finally decided, ‘I need medicine. I can’t live this way,’” Natalie remembered. During an 8-week treatment program, Natalie was introduced to an injectable medication that she credits with saving her life. Her desire to be an inspiration to others returned along with her passions for fashion and entrepreneurship. After her release, her loved ones helped her begin to work on her career. Natalie worked as a cashier and sales associate in a corporate cafe, quickly moving to a manager position. While working full time in that position, she also started working part time in a retail position. She enjoyed setting up the store and felt fulfilled surrounded by the fashion she had fallen in love with at such a young age. Natalie had a strong work ethic and took pride in her work. Within two months she was offered a manager position at the retail store, earning the title of Manager at both companies simultaneously. After some time, she switched companies and landed a dream manager position where she and her team were crushing their sales goals, but when she was informed that the store would be closing, she saw the start of another mental breakdown. Six months of unemployment and growing insecurities as her fiancé traveled with his band led up to another attempt at suicide. Natalie remembers calling her fiancé, who was in another country at the time, while she was incoherent after taking medication in an attempt to take her own life. The next thing she remembers is gasping for air as she woke up in a hospital room with him by her side. Ultimately, the relationship did not work out and Natalie placed higher priority on material things than her mental health. She again stopped taking her medication and experienced another manic episode. She lost another job and moved to New York for two months. While there, she began to experience extreme paranoia, believing that the FBI and God were sending her messages, and she started to act on those delusions. Natalie became homeless for a time and was hospitalized twice. Her dad visited and she talked to her friend every day. This friend made the trip to New York to pick Natalie up from the hospital when she was released, and she moved with him back to Columbus. A new doctor in Columbus eventually cleared Natalie to work again, where she started to reconnect with people and her mental health improved. She now sees her counselor at North Community Counseling Centers on a regular basis and credits them for sticking by her side through her many ups and downs over the years. Although Natalie has had a roller-coaster ride of a life, she has believed for a long time that everything happens for a reason. You just have to learn, change, adapt and evolve. Natalie is now celebrating her newlywed status with the man who picked her up at the New York hospital and is enjoying life in recovery. For Natalie, living in recovery means working toward her goals and using her unique creativity to follow her dreams. Natalie still loves the fashion industry and has big ideas for creating a shopping app with her husband. Natalie is currently interviewing for a life changing position, TV/Radio Show Host, which could help her pursue her passions in music. Song writing helps her to sort out her feelings and allows her to share her experiences with others. On her LinkedIn page, she proudly describes herself as a “Sales Professional | Songwriter | Advocate” and embraces her dynamic personality. In her spare time, Natalie also enjoys practicing meditation along with other grounding techniques. Her advice to others living with a mental health disorder is to know your diagnosis and know the warning signs of when you need to ramp up your appointments and medication(s). She also suggests keeping a mood journal to see your progression. Natalie now understands the necessity of focusing on recovery and taking it one day at a time. To others in her life, Natalie stresses the importance of smiling when you see someone, even if they are a stranger, because you never know what they are going through and how much a friendly face could help someone find a pin drop of light in the darkness.